Posted by Dave Emory ⋅ April 3, 2015Post a comment Email This Post Print This Post Tweet This! . . . . After World War II, the American people thought that Nazi Germany had been defeated and the “war” was over; this book demonstrates that it never was. Instead, we were told that Communism was the new threat and we had to pull out all the stops to prevent a Communist takeover of the country. And so our military and our intelligence agencies collaborated with surviving Nazis to go after Communists. We refused to pursue worldwide right wing terror groups and assassins. After all, they were killing Communists and leftists; they were doing us a service. Like Hoover and the Mafia, the CIA refused to believe a Nazi Underground existed even as they collaborated with it (via the Gehlen Organization and the like). The whole thrust of this book has been that American leaders in business, finance, media, and politics collaborated with Nazis before, during, and after the war. The West’s share in the ‘blame” for Al-Qaeda, et al, goes back a long way–before Eisenhower–to a cabal of extremist US Army generals and emigre Eastern Europeans who didn’t have much of a problem with Nazism since they feared Communism more. The Church, the Tibetans, the Japanese, the Germans, the Croatians–and the Americans–all felt that Communism was the greater danger, long before WWII. We enlisted war criminals to fight on our side. We appropriated the idea of global jihad from the Nazis and their WW I predecessors. We amped up their plan to weaponize religion and convinced Muslims, who hated each other, to band together to fight Communism. And when Afghanistan was liberated and the Soviet Union was defeated? September 11, 2001. . . . This program highlighting organizations that comprised the postwar Nazi underground. The most important of these is Die Spinne, engineered by Otto Skorzeny. Skorzeny also helped establish Merex, an arms trafficking firm which we discussed in AFA #32. One of the Nazi underground’s most high-profile operatives was Luftwaffe pilot Hans Ulrich Rudel. In addition to working with Third Reich alumni as sort of a traveling ambassador-at-large, Rudel also worked with the U.S. government in the postwar period, developing combat aircraft including the F-16 and the A-10. In the context of postwar luminaries of the Nazi underground, Peter highlights the remarkable career of Francois Genoud. Next, the program sets forth the American adaptation of the global-jihadis-as-proxy-warrior stratagem minted by Max von Oppenheim in World War I and then resusicated by the Nazis during World War II. Seeking forces with which to pursue a global anti-Communist agenda during the Cold War, the U.S. turned to the Muslim Brotherhood, supporting the organization through the CIA and State Department. Stille Hilfe, one of whose most important members is Gudrun Burwitz, SS chief Heinrich Himmler’s daughter. HIAG–the “self-help” organization of the Waffen SS. The best known of these postwar Nazi organizations, ODESSA. Discussion of the Paladin mercenary group, a Skorzeny operation. The Dalai Lama’s decades-long relationship with SS war criminal Bruno Beger, an anthropologist who was on the original 1938 SS expedition to Tibet. 1. The program begins by highlighting the organizations that comprised the postwar Nazi underground. The most important of these is Die Spinne, engineered by Otto Skorzeny. The Hitler Legacy by Peter Levenda; IBIS Press [HC]; Copyright 2014 by Peter Levenda; ISBN 978-0-89254-210-9; pp. 167-168.
. . . . Die Spinne is another case entirely. This was the creation of Otto Skorzeny (he of the Hunting Society) and it leads us into the deeper world of ODESSA. More than any other single individual, Skorzeny is the entry point to the world of the Nazi underground and the links between resurgent Nazism and what we are calling Islamist jihadism, with the connective tissue of the dictatorships of Latin America: first stop for most of the fleeing Nazi fugitives. Die Spine and its offshoots provides us with a glimpse into the interface between Western intelligence agencies and their ideological conflict with Communism on the one hand, and with experienced and dedicated anti-Communists on the other. I have written elsewhere that the deal America made with Nazi scientists under the rubric of Operation Paperclip, and with Nazi spies under the rubric of the Gehlen Organization, was a Faustian pact with the Devil: the point at which America bartered its soul in exchange for a short-lived sense of security. The deal that American and other Western intelligence agencies and political leaderships made with the brutal presidents of Latin American and Asian nations in the 1950’s, 1960’s and through the 1980’s is a codicil to the pact. What the American government could not effectively promote within its own borders –wholesale suppression of any opposition on a massive and unapologetic scale–it succeeded in accomplishing throughout Latin America, and by extension into Southeast Asia . . . . The best known of these organizations, ODESSA. 3. One of the most important figures in the postwar Nazi underground was decorated Luftwaffe pilot Hans Ulrich Rudel, who also helped design aircraft for the U.S. Air Force, developing combat planes including the F-16 and the A-10. The Hitler Legacy by Peter Levenda; IBIS Press [HC]; Copyright 2014 by Peter Levenda; ISBN 978-0-89254-210-9; p. 162.
. . . . Since Rudel had not been indicted for war crimes, he was free to roam about the world promoting Nazism and becoming a kind of one-man clearinghouse for communications between Nazis in various parts of the world, many of whom were not as free to travel due to their need for security and the complex paper trails they had created to disguise their identities. In this capacity, Rudel could carry messages between fugitives, help arrange financial support, and keep the spirit alive among the members of the Bruderschaft, the “Brotherhood.” His address book is ample evidence of the connections Rudel had around the world with both prominent Nazis and sympathizers, and with those less well-known or living under pseudonyms. It also reveals the extent of Rudel’s connections with influential and powerful members of various governments and multi-national corporations. In fact, his relationship with Pierre Sprey was based on just that kind of government contact, for it was due to Rudel’s proficiency as a wartime ace pilot that his knowledge and experience was valued by the US Defense Department, for which Sprey worked in developing the F-16 and the A-10 aircraft in the 1960’s and 1970’s. Sprey was encouraged to talk about aviation with Rudel if it would help aircraft engineers design a better plane. In other words, one could say that for awhile at least Hans-Ulrich Rudel worked for the Pentagon. . . .
4. Skorzeny also helped establish Merex, an arms trafficking firm which we discussed in AFA #32. The Hitler Legacy by Peter Levenda; IBIS Press [HC]; Copyright 2014 by Peter Levenda; ISBN 978-0-89254-210-9; p. 173.
. . . . Skorzeny wasn’t satisfied with just Merex, however. As entrepreneurial as ever, he founded a series of other companies with dubious pedigrees: such as the Paladin Group, Based in Alicante, Spain it was designed to provide paramilitary training and support to a variety of causes around the world. Foremost among these tasks was tutoring security personnel in Egypt and Argentina, and for this, he hired as manager one Dr. Gerhard Hartmut von Schubert, who formerly worked for Goebbels’s Propaganda Ministry (like Johann von Leers and Werner Naumann). Paladin Group also provided logistical support for the Palestine Liberation movement. In addition, Skorzeny worked with the H.S. Lucht Corporation, another of the ubiquitous “import-export” firms used to provide cover for unsavory trade, headquartered in Dusseldorf and directed by Werner Naumann himself. . . .
5. Next, we highlight the career of Francois Genoud, one of the most important figures of the postwar Underground Reich. The Hitler Legacy by Peter Levenda; IBIS Press [HC]; Copyright 2014 by Peter Levenda; ISBN 978-0-89254-210-9; pp. 174–176. . . . . Another key figure in the underworld of the global Nazi network–and close friend of Skorzeny, Rudel, and Schacht–was the Swiss financier and former Abwehr agent Francois Genoud (1915-1996). Although a Swiss citizen, Genoud was a devoted Nazi to the end of his days, like his colleagues. The difference lay in Genoud’s post-war profession as a financier. It has largely been accepted that the funds to which Genoud had access were secret accounts held in Swiss banks by Nazi leaders and fugitives. He managed to parlay what was a considerable fortune into even greater wealth through a series of shrewd investments, as well as what might be called “protection money” from a variety of sources. He was the literary executor of the works of Adolf Hitler, Martin Bormann, and Josef Goebbels, among other claims to fame, and collaborated with the Holocaust denier and historian David Irving (whose name also appears in the Rudel address book, along with Genoud and Skorzeny). As the post-war decades progressed, Genoud would become a key figure in the financing of Arab literation movements throughout North Africa and the Levant. . . .
. . . In 1954, he began financing the Algerian Liberation Front, an organization to which he already had been supplying weapons after meeting members of the Front in Egypt. In 1955, he created AraboAfrika, another “import-export” company, to assist the Algerian cause and to provide a cover for anti-Israel propaganda. In 1958, he went on to create a medium for the transfer and laundering of cash for Algerian, Moroccan, and Tunisian liberation groups–the Arab Commercial Bank–with the indispensable Hjalmar Schacht as a partner. By 1960, he added the Palestinian cause to his resume, and in particular financed the defense of members of the Popular Front for the Liberation of Palestine (PFLP), who blew up an El Al Airliner in Zurich. This involvement in providing expensive defense reams extended to the trials of Klaus Barbie and Adolf Eichmann, with Genoud generously supplying whatever funds were needed to obtain the best possible representation. In 1969, he put members of the Palestine Liberation Organization (PLO) in contact with Nazi personnel who would provide training in weapons, sabotage, and infiltration techniques. (This was the same period–from 1967-1969–that the author made contact with the PLO at their offices in New York City, having first dealt with a German woman who was their receptionist.) Genoud was a serious supporter of Palestinian liberation throughout his life, and, according to author Peter Wyden, was also a confidant and mentor of Ahmed Huber, the Swiss supporter of Nazi and Islamist causes. . . .
. . . . If Hjalmar Schacht was “Hitler’s Banker,” Genoud was the banker of the Nazi and Arab resistance movements in Europe and the Middle East. He was a friend of the notorious assassin “Carlos the Jackal”–Ilich Ramirez Sanchez–and assisted the terrorist in several of his missions. He also helped financially support the Ayatollah Khomeini during the latter’s exile in France during the regime of the Shah of Iran. Genoud and Schacht were partners in many of these ventures, and Genoud represented Schacht’s financial interests where feasible–occasionally helping the older man make sound investments, or in brokering deals between Arab nations and the European firms that were in Schacht’s comfort zone. That both men were instrumental in providing financial and logistical support to ODESSA is not in question; but they extended that assistance to ODESSA’s natural allies, the Islamist resistance groups that were founded to remove all traces of their former colonial masters in North Africa and the Levant and to wage an ideological war–a global jihad–against Israel and the West, under the guise of religious fervor. . . .
6. Next, the program sets forth the American adaptation of the global-jihadis-as-proxy-warrior stratagem minted by Max von Oppenheim in World War I and then resusicated by the Nazis during World War II. Seeking forces with which to pursue a global anti-Communist agenda during the Cold War, the U.S. turned to the Muslim Brotherhood, supporting the organization through the CIA and State Department. 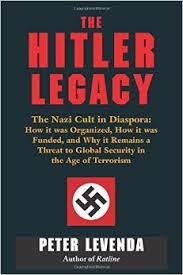 The Hitler Legacy by Peter Levenda; IBIS Press [HC]; Copyright 2014 by Peter Levenda; ISBN 978-0-89254-210-9; p. 181. The Hitler Legacy by Peter Levenda; IBIS Press [HC]; Copyright 2014 by Peter Levenda; ISBN 978-0-89254-210-9; pp. 184-185.
. . . . This was essentially what CIA was already doing with their Christian networks and their infiltration of the World Council of Churches, the World Anti-Communist League, the League of Captive Nations, and so many others. It didn’t require much imagination to port the Christian strategy onto a Muslim-based agenda. Some of this was done through Radio Liberty, a CIA asset in Europe that beamed pro-Islamic and anti-Communist programming into the Soviet Union. The CIA operation utilizing Muslims–and specifically members of the Muslim Brotherhood–was run by an agent named Bob Dreher. The US government felt that helping to build an Islamic Center in Munich would attract the “right kind” of Muslims to their cause, and to that end, a mosque was build that later became the foothold in Europe (and the West) that the Brotherhood needed. They used the mosque to disseminate Brotherhood-oriented propaganda and to act as a kind of safe house for Brotherhood members. The Muslim Brotherhood official Said Ramadan became central to that strategy, and in 1953 he had his photo opportunity with the President of the United States. . . . The Hitler Legacy by Peter Levenda; IBIS Press [HC]; Copyright 2014 by Peter Levenda; ISBN 978-0-89254-210-9; pp. 239-240. One expedition mounted by the SS-Ahnenerbe, and with the specific blessing of Heinrich Himmler, ws the 1938 SS-Tibet Expedition led by Ernst Schafer and including the anthropologist Bruno Beger among the expedition members. While the Dalai Lama was only three years old at the time of this expedition, the Panchen Lama was available to greet the Nazis to the Himalayan kingdom and to provide them with texts (including the 108-volume Tibetan scripture, the Kangjur), animal and plant specimens, and photographic footage to take back with them. In addition, Beger conducted ethnographic and anthropometric research among the Tibetans, measuring their skulls with calipers, for instance. Photographs of this expedition are still extent and examples of it are found in the photographic section of this book, including a famous photo of Beger measuring the skull of a smiling Tibetan maiden. . . .
. . . . by the time the SS-Tibet Expedition arrived back in Germany, the Second World War was just beginning. Bruno Beger–the anthropologist with the calipers–found himself gainfully employed in building an ethnographic museum of the human race, moreover one which would demonstrate the superiority of the Aryan over the Semitic peoples. In order to do this, he needed a representative sampling of human skulls for his collection. Eighty persons were murdered at Natzweiler-Struthof concentration camp to satisfy this requirement. After the war, Beger was denazified. While he was convicted of the murder of more than eighty individuals for the express purpose of building his skull collection, he never served a day in prison. In fact, he remained a close friend of the Dalai Lama all his life, just as his old SS colleague Heinrich Harrer. . . . The Hitler Legacy by Peter Levenda; IBIS Press [HC]; Copyright 2014 by Peter Levenda; ISBN 978-0-89254-210-9; pp. 236-237. Thus we have the strange tableau of an SS man and committed Nazi in Lhasa, at the same time that his friend, the Dalai Lama, is officially in contact with the US government concerning the Chinese situation. What did Heinrich Harrer know of these negotiations? How much did the Dalai Lama himself know at this time? Even more to the point, was American intelligence–in the form of the CIA and the State Department–aware of Harrer’s presence in Lhasa and the influence he had over the king? Harrer would remain a close friend and ally of the Dalai Lama for the rest of his life. As a Nazi and a member of the SS as well as of the SA (the Sturm Abteilung or Storm Troopers), Harrer would have been a devoted anti-communist, and would have seen in the struggles of the Tibetan people against Chinese Communism an echo of his ow country’s fight against the Soviet Union. Harrer, as someone with a demonstrated and intimate knowledge of the landscape, culture, languages, and environment of northern India and Tibet would have been an excellent choice for American intelligence as an asset to run operations against the Chinese. After all, the CIA had hired the Gehlen Organization at the end of World War Two to run ops against the Russians from eastern Europe. Reinhard Gehlen was a Nazi intelligence officer who bartered his way to freedom from prosecution by offering his services (and those of hundreds of his close personal friends in the SS, Gestapo, and SD) as an anti-communist fighter against the Soviets. It would have made perfect sense to hire Nazis who had experience of Asia in the fight against Chinese-style Communism.